Increase brand awareness by taking advantage of an all new way to communicate with Stickers in iOS. In 2016, iOS users are sending over 200,000 iMessages per second. That’s 6.3 trillion messages a year. 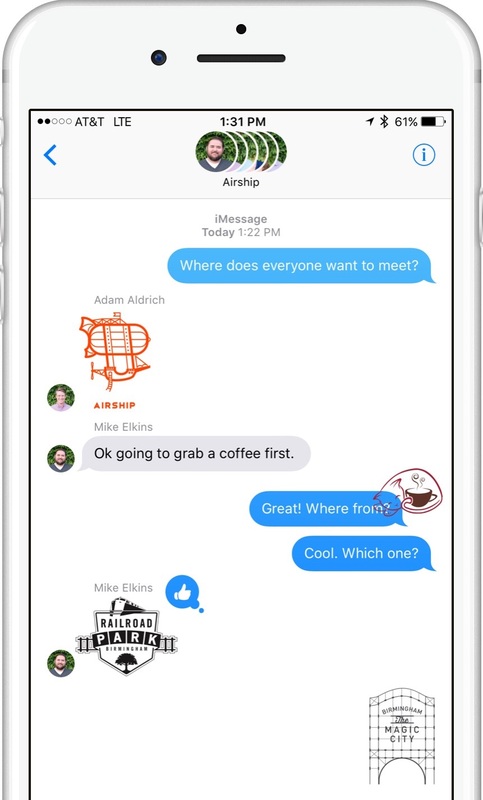 Sticker Packs and Emojis offer a way to add a human connection to the text, conveying feelings that are more that a short burst of characters. Using Sticker Packs, companies can expose new customers to their corporate brand and reinforce brand identity with existing customers. Adhesives gives companies an easy entry into the world of Sticker Packs. Using Adhesives, you can create and deploy your Sticker Pack without involving internal IT teams or spending thousands of dollars developing your own Sticker Pack App. Adhesives CMS allows your marketing team to create and upload new stickers, track the downloads of your app, and re-order the arrangement of your stickers, bypassing the IT department and the approval of Apple for each modification to your app. CREATE YOUR APP with Airship's development team. We work with your marketing team to build and deploy your initial app in the Apple store. Airship’s team hand walks your app through the approval. ADHESIVES IN ACTION means you can change and modify your stick pack as often as you want, without having to resubmit your app the App Store for approval. Upload a holiday sticker, place your most popular stickers at the top, or simply refresh your content. It’s easy. UPDATE STICKERS without requiring your sticker pack users to update their app on the app store. Easily push new stickers out to your fans on your terms. TIME TO MARKET is reduced from weeks to hours or days. Airship’s team understands the app deployment process and Adhesives is already approved by the App Store. Adhesives is created by Airship, a web and mobile application development company in Birmingham, AL. Adhesives is a web application designed to help companies create, deploy, and maintain corporate Sticker Packs on iOS 10 via the App Store. Airship delivers high quality software solutions companies rely on to turn ideas into reality. Explore your ideas with Airship today.